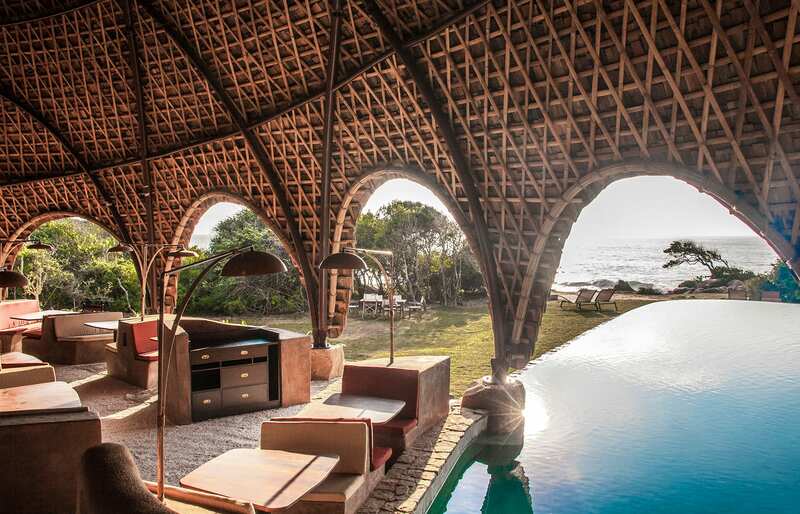 Facing the dramatic seafront on the south edge of Sri Lanka, and surrounded by the dense jungle of the Yala National Park, this romantic lodge sets a new benchmark for resort design and safari luxury on the island. 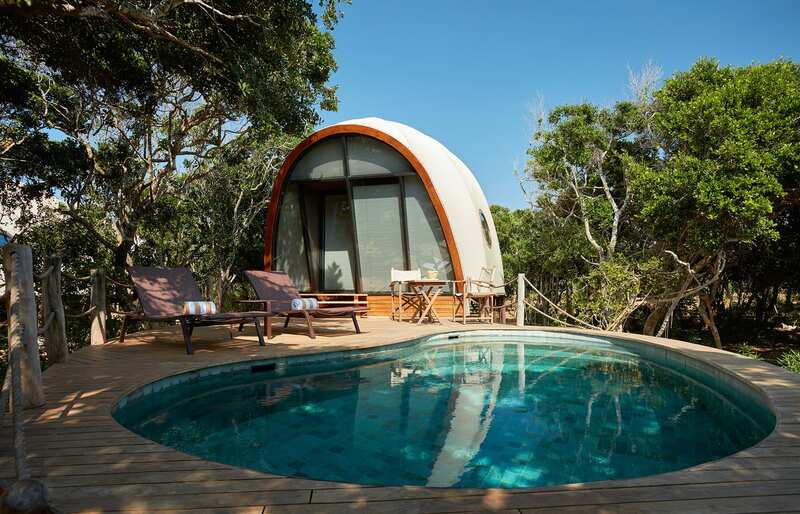 Those of you who follow our reviews here and our journeys on Instagram have an idea of what sort of hotels we choose to review — and it should not come as a surprise that out of all the properties we could visit in the south of Sri Lanka we picked the Wild Coast Tented Lodge. 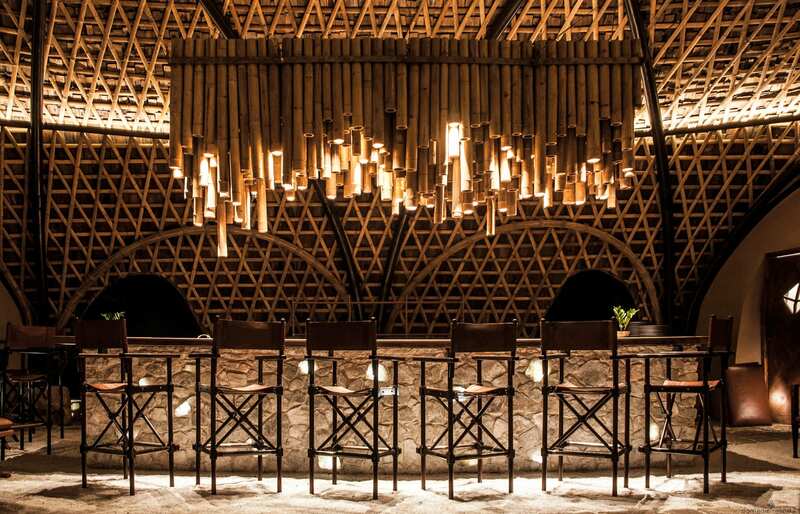 The amazing concept and design of this place caught our eye as early as December 2016 when we decided to include the lodge in our list of the top 70 luxury hotel openings of 2017. But back then we had not imagined just how well this new development from Resplendent Ceylon would turn out. 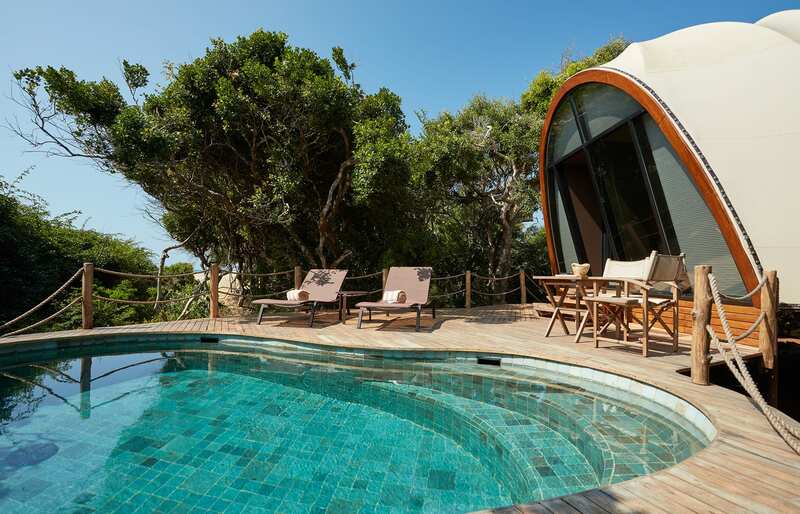 The first thing to note about the Wild Coast Tented Lodge is its design. Take the welcome area and the dining complex. 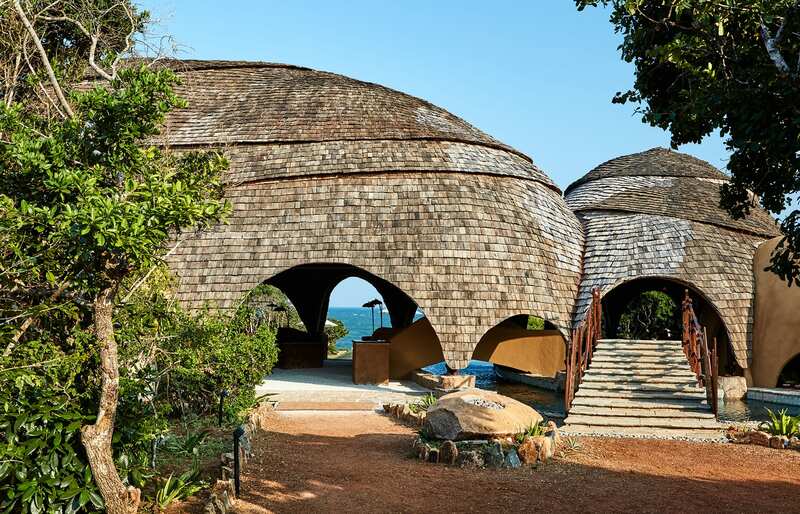 They are shaped into organic domes that evoke the rugged nature of the coast. 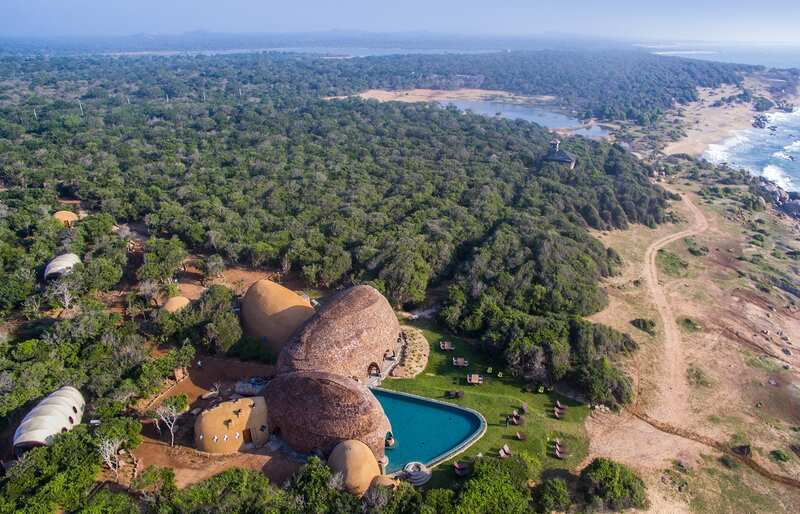 Built on a steel frame with untreated wood and covered by rough-hewn wood planks, the buildings are designed to resemble giant boulders — while their interiors bring a touch of classic African safari luxury to the wildness of Yala National Park. 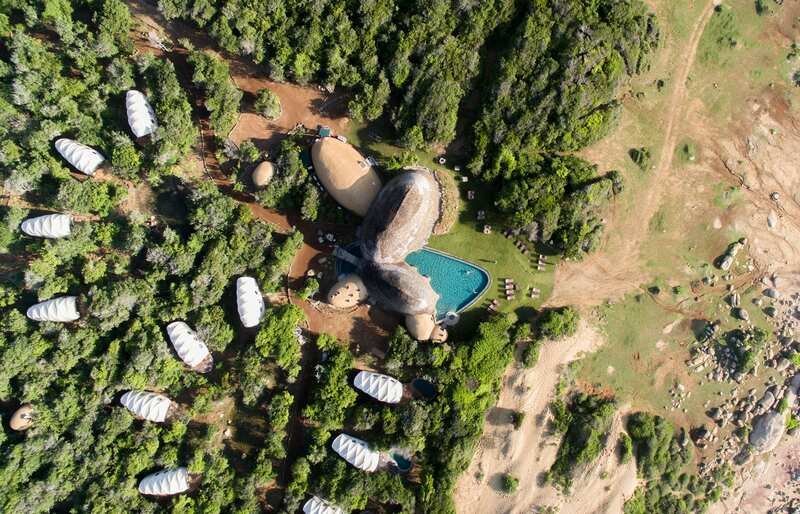 The stars of the property are the guest tents, shaped like white “cocoons” (and thus named). 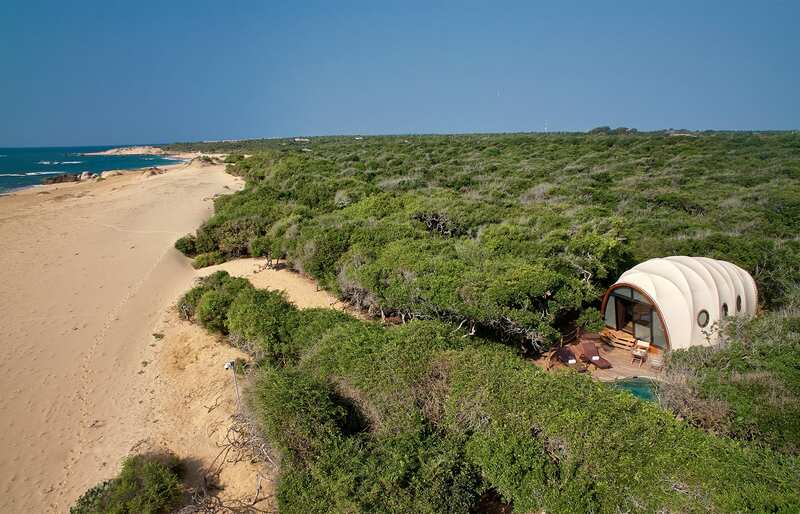 They are set on an open-plan, joining sleeping and living area under a high-domed roof covered with canvas. 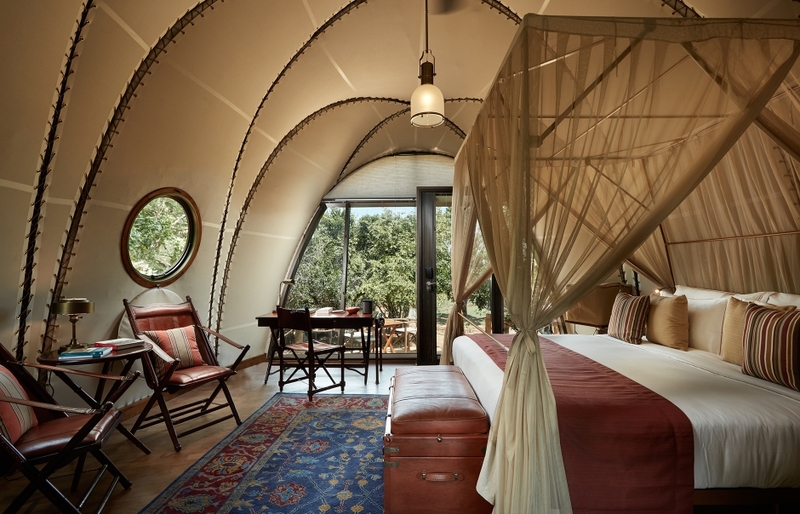 The interiors bear a style of a colonial expedition, and their faux-vintage theme is a great match for the contemporary design of the Cocoon’s arched structure, trimmed with walls of glass at two ends. 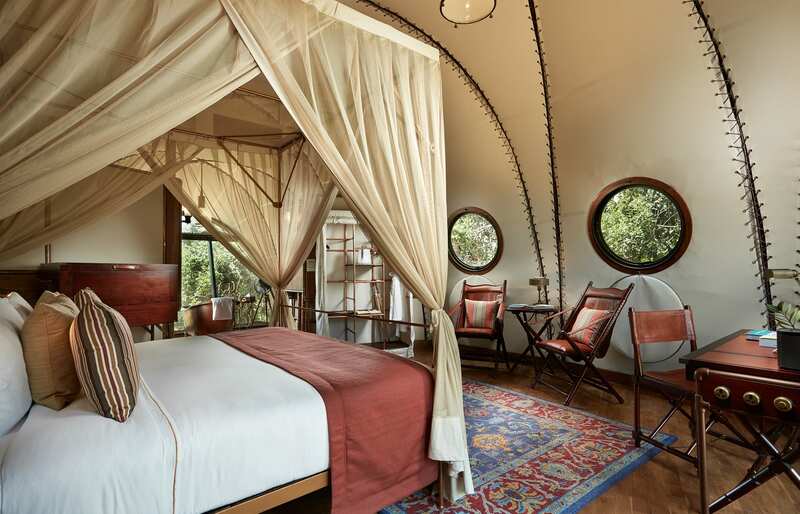 The freestanding handmade copper bathtubs and sumptuous four-poster beds are part of the charm. 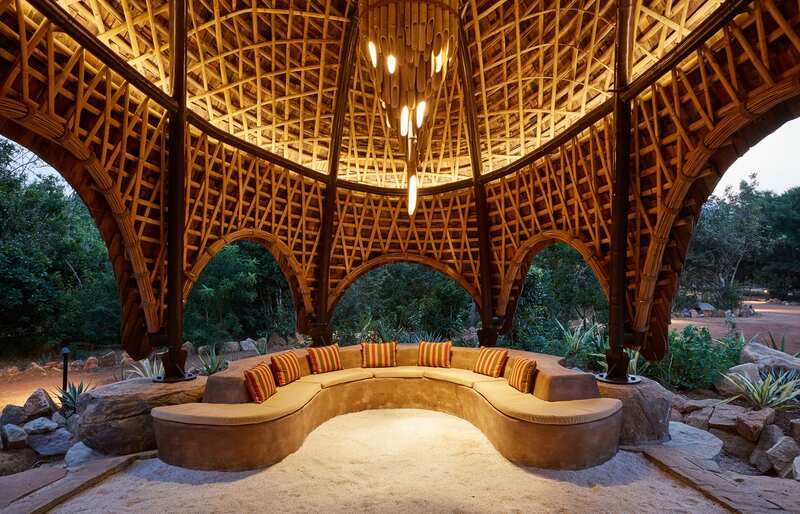 But the lodge has a lot more to offer than the very cool architecture and design. 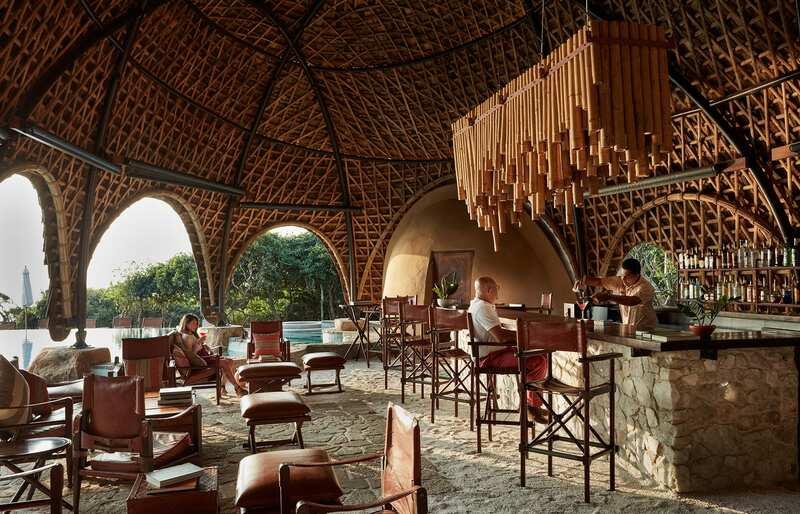 The Yala National Park, on the edge of which the Wild Coast Lodge is located, is one of the best places to encounter elephants — in fact, sometimes they visit the waterhole dug in the middle of the lodge, as the site is not fenced (it’s why the staff insists on accompanying the guests after dark). The forests and marches of the Yala park are famous for dozens of other species of mammals (plus birds and crocodiles) — with the elusive Leopard a star attraction. The big cats fare relatively well in the park and draw hordes of tourists, who want to catch a glimpse of these beautiful animals. Guides at the Wild Coast Lodge know the area well and are expert in tracking the cats… though admittedly these days the main tool for finding them is the mobile phone, used to alert others by the first guide that spots the leopards. 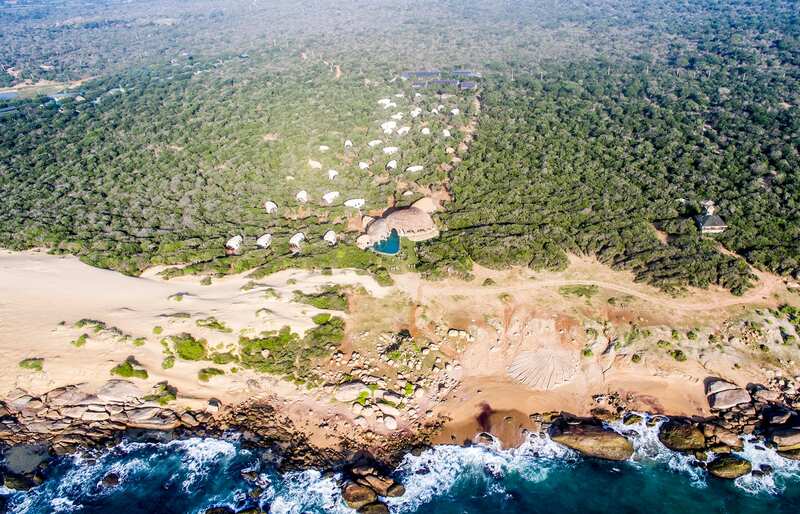 To all who associate lodges in remote places with roughing it out, the Wild Coast Lodge has a surprise: it’s nothing of the sort. 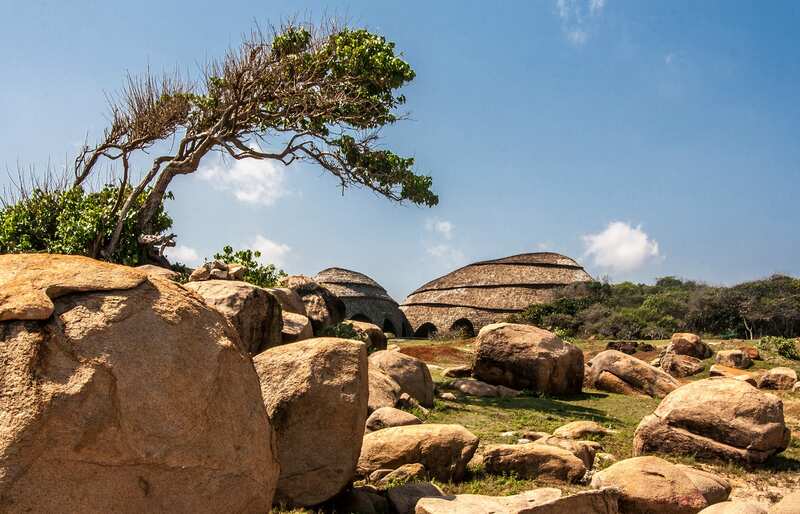 The design may reflect the craggy landscape, but the experience has more to do with air-conditioned bedrooms, soft pillows, expensive toiletries, five-star dinners, spa experiences… and the free broadband WiFi. The enormous swimming pool that flows into the shell of the main building brings to mind many luxury beach resorts that we’ve been to. A beach resort this is not, however. Picnics al fresco on the sand dunes and sundowner cocktails near the shore are standard treatment here, but the seafront is rough, untamed and untidy; and the sea very unfriendly to anybody crazy enough to try swimming. A “wild coast” indeed. But, all this makes the beach nice for a stroll—or more like hiking, in places. The remote location of the lodge does not mean it’s inaccessible. While the difficult geography makes fast travel inland a real challenge, the capital Colombo and Sri Lanka’s main airport are linked to Yala by a motorway. The drive is smooth and easy, though it still takes well over six hours. This is why it’s a good idea to combine the Wild Coast stay with the lodge’s sister properties, e.g. Ceylon Tea Trails deep in the Tea Country or Cape Weligama, located on the coast near Galle. 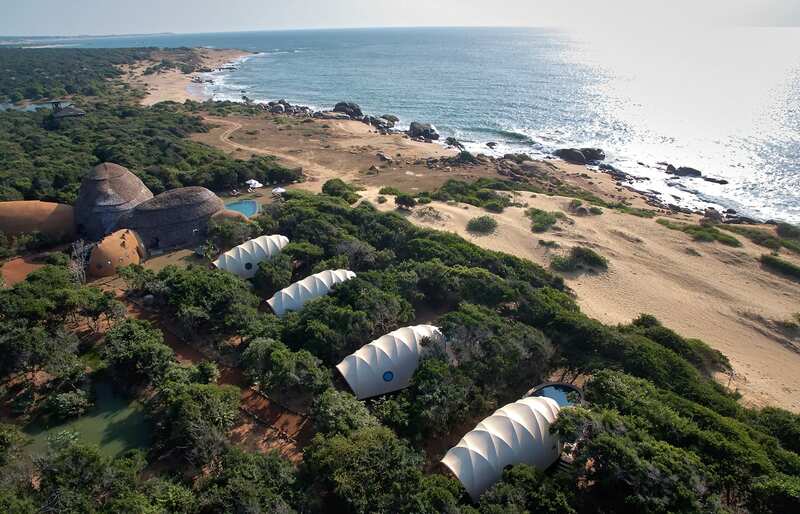 We did visit them all and by comparison, the Wild Coast Lodge is the most unique, and it will remain in our memories as the place that brings classic safari vibe to the wilderness of Yala National Park. 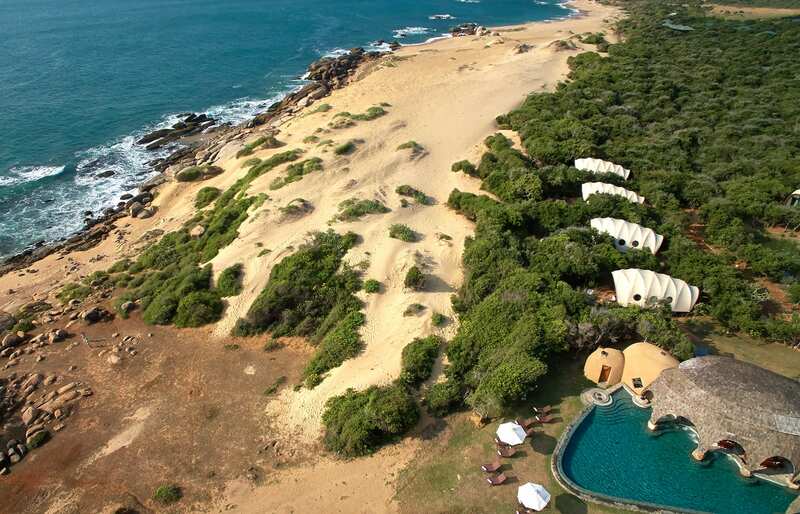 Pair breathtaking location and spectacular design with a high level of service and great safari experiences and you may well come up with the Wild Coast Lodge. 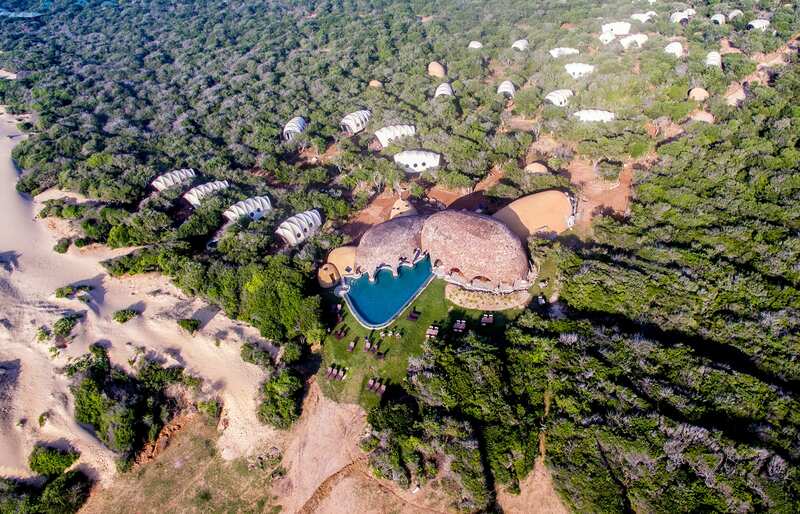 Sophisticated, beautiful and private, this place is perfect for anyone wanting to encounter wildlife without compromising on luxuries. 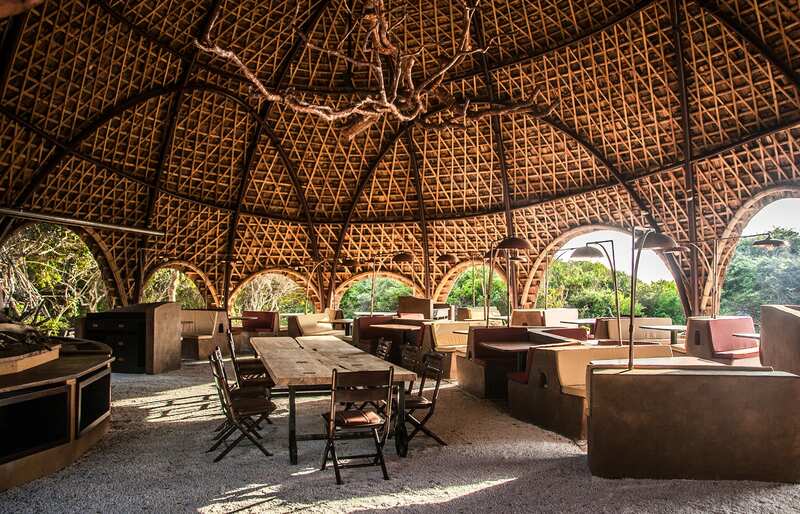 The architecture of the main buildings of the lodge is sensational. 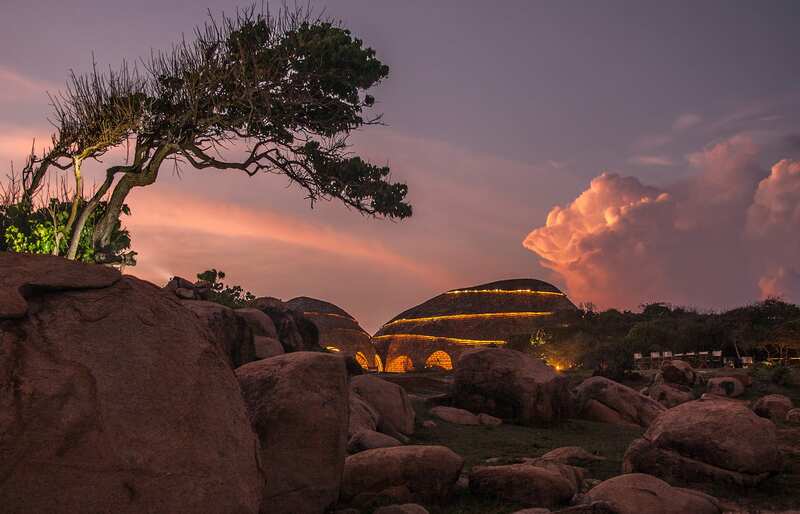 The huge shells forms resemble the rock outcrops and boulders that pepper the landscape of the Yala coast. 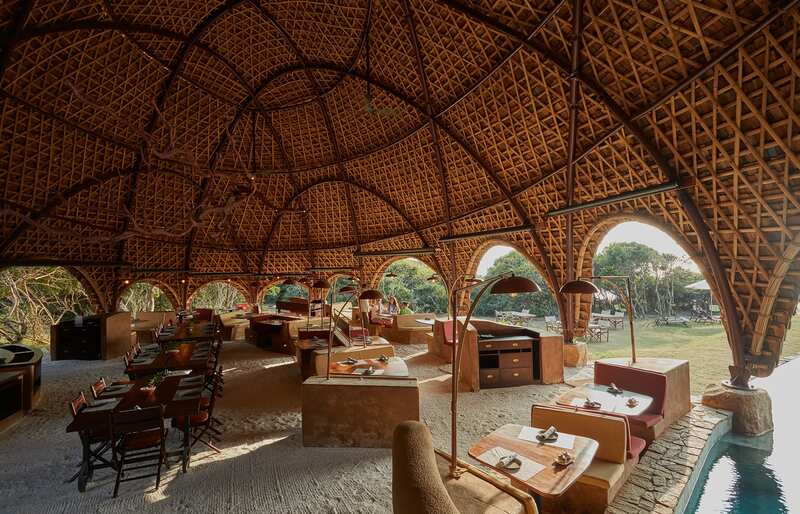 This unique design was borne in the creative minds of Nomadic Resorts, which an association of English, Sri Lankan and Dutch designers. 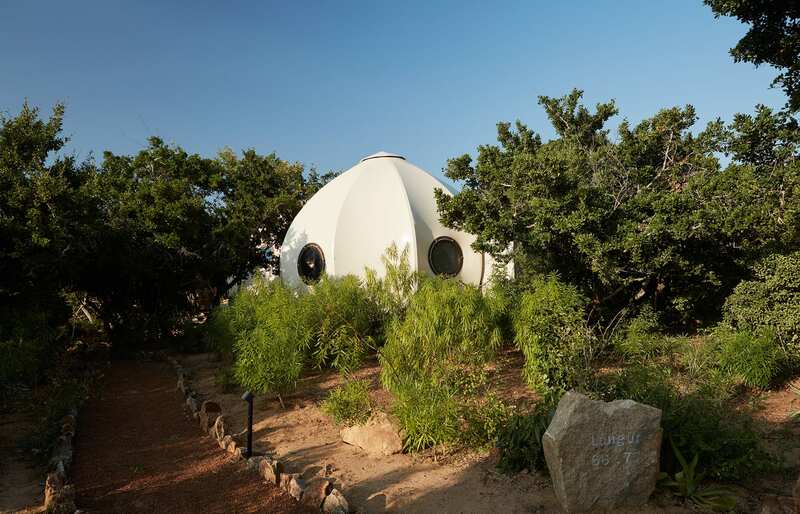 The guest tents, called the “cocoons” have the most amazing design and we loved their interiors, too—their quasi-retro style contrasts perfectly with the smooth shapes of the tent. 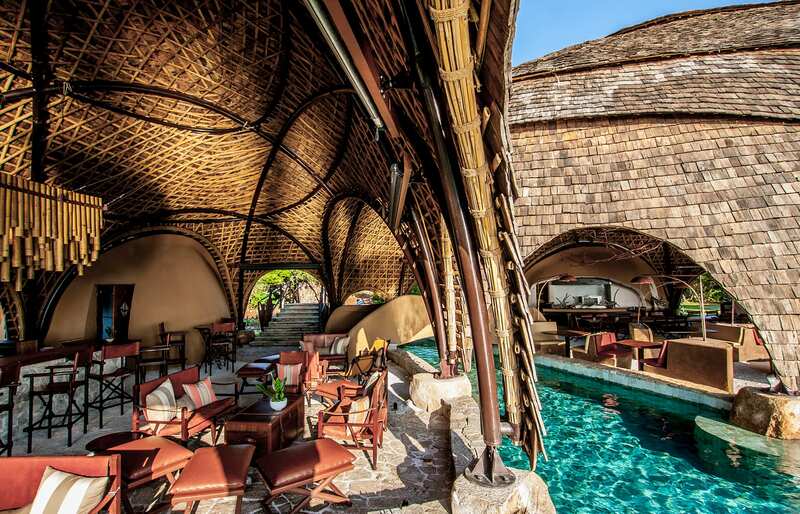 Some Cocoons have small private swimming pools, and they are lovely, especially on a hot day. Superb location. 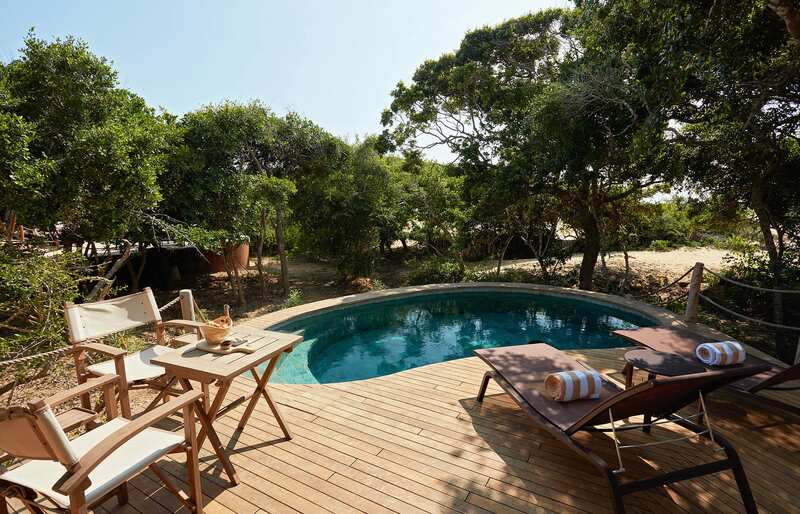 Wedged between ferocious sea and dense tropical forest, the lodge is only some 10 minutes away from Sri Lanka’s most celebrated game reserve, the Yala National Park, home to the endangered leopard. Despite the seemingly isolated location, Wi-fi is fast and works well. Amenities and luxuries are state-of-the-art. Food is really, really good — perhaps the best we had in Sri Lanka overall. There is only one restaurant, but the menu is varied and dishes delicious. All meals were served a la carte, including breakfasts, except barbeque dinners which are organised every other day. The staff takes the experience up a notch. Really well-trained, courteous, and ensuring excellent service — they make the lodge really feel like a five-star property. The wild waves crashing on the beachfront boulders are a nice backdrop to sundowner drinks. The best moments! 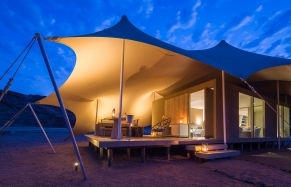 Safari excursions take place in the early morning or late afternoon. At these times, the National Park can get very busy, with many vehicles competing for the best place from which to see the Leopard or other big game. The lodge is not fenced, so various animals sometimes venture in. You are guaranteed to see the inquisitive monkeys, and frequently boars. 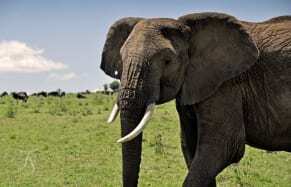 Elephants were also reported to visit the watering hole in the middle of the lodge. The staff will insist on accompany you to the tent after dark. The seashore is wild and there isn't much of a beach for sunbathing, but it is nice for walks. There is a small spa facility, featuring two treatment rooms. Key ingredients of many oils, scrubs and poultices are the local tea and cinnamon. 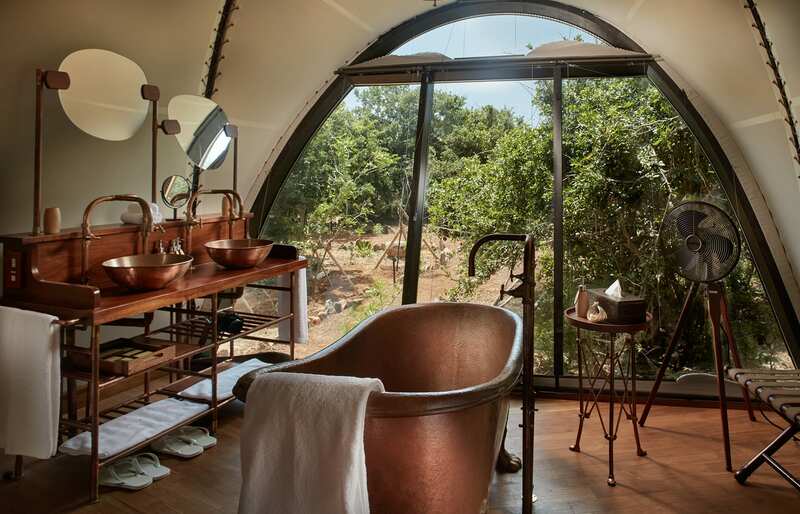 As the bathroom end of the guest Cocoons is capped with a floor-to-ceiling window, some of the cocoons have a limited privacy. Don't try to swim in the sea, and be careful on the edge of the beach. The waves are ferocious here. 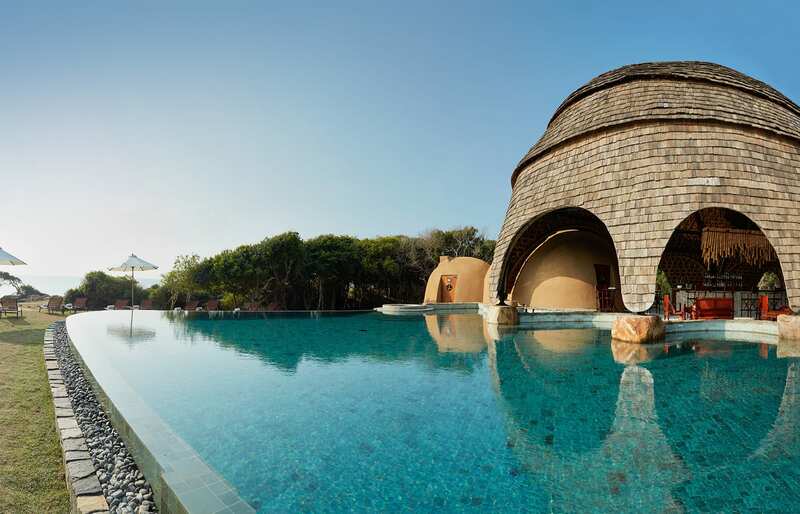 The best season to visit the south coast of Sri Lanka is from December to March. The weather is the driest then. The lodge is part of the Relais & Chateaux portfolio. 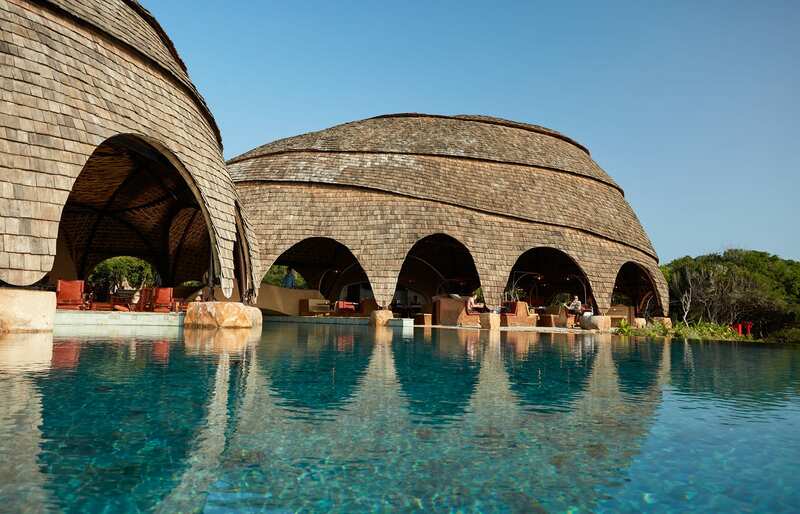 It is managed by Resplendent Ceylon, who are on track to launch one more hotel soon, near Sigiriya. We are looking forward to its opening.